Most ID card holders are available with a custom imprint of your name, logo or message. The five most common methods for achieving this are full color process printing, pad printing, screen printing and hot stamping. We are proud to keep up with the best technology as it changes. 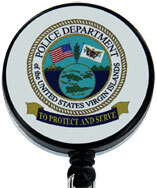 The most commonly used badge reel ID card holder imprinting method. Allows for the reproduction of full color logos and designs. With this method the badge reels are not printed on directly. Instead, the full color imprint is applied to the surface of vinyl with an adhesive back. The vinyl is very durable and is the same material used for bumper stickers and the like. The most common color is white, but clear is also available. Full color printing is based on the cmyk color system. Basically, these four colors cyan, magenta, yellow and black when combined in various percentages can produce millions of colors. The actual machines range from table top models the size of an ink jet printer to full blown floor models with all the bells and whistles. All machines will print and contour cut the vinyl to fit the object imprint surface area. Two common printing mechanisms are in use. Machines using ribbon cartridges are slower and cost more to run. Each color is put down one after the other. The faster and more economical machines use ink cartridges. With these models all four inks are applied at the same time. Of course the faster machines cost about three times the slower ribbon based models. A common process for custom printing badge reel id card holders and other objects. Limited typically to two colors. Applies ink directly to surface of badge reel. More vulnerable to wear than the full color process method. The pad printing process is derived from that of screen, rubber stamp and photogravure printing processes. The actual process can divided into five steps. First a metal plate containing an etching of the image to printed is flooded with ink Also during this step the ink is wiped off the plate except for the ink associated with image. The second step involves transferring the image from the plate to a rubber pad and is referred to as the pick-up step. The third step involves lifting the pad away from plate followed by a short delay which allows the ink to adhere to the pad. The actual depositing of the image onto the substrate is accomplished in the fourth step. The release of the printing pad from the substrate is the fifth and final step. These five steps are then repeated for the next object to be printed. Pad printing does have its limitations. Generally this method is good for printing only up to two colors and limited to relatively small images. Since the actual thickness of the ink deposited is so thin, pad printed images a more vulnerable to being worn and scratched off. This imprinting process produces a very high quality imprint. The image is transferred to the material via heat and pressure. Dye sublimation printing is used for single as well as multi color designs on one or both sides of the material. 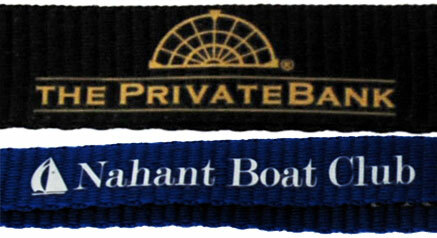 The badge holder material used is always white polyester from 3/8" to 1.0" wide. The most common width being 3/4". There are two main stages to dye sublimation. The first step involves printing the design on transfer paper. In the second step the design is transferred to the material using both heat and pressure. This process results in the material yarns accepting the dye color. Because the imprint does not sit on top of the material surface as in screen, pad and hot stamping the imprint is less subject to wear from abrasion. Due to the set-up process this method typically requires the highest minimum quantity order. This method is commonly used with neck lanyard ID card holders. Popular materials being used include cotton and nylon. Used for text alone or in combination with simple logos. Second side printing available. Screen printing is a process used to transfer a design to material such as a t-shirt, jacket and lanyard. Both manual and automated printing machines are in operation. Several steps are involved. First a clear acetate film is created of the image to be printed. Next the film is exposed to a fine mesh screen. The screen is opaque in all areas except for where the imprint design is located. The screen is then placed over the material to be printed and lowered in the exact imprint position. The next step ink is moved over the imprint area of the screen resulting in ink be pushed through the fine mesh and onto the material. The screen is then lifted and the process is repeated for multi-color designs. In between printing the previous color is dried using a flash drying unit which is placed over the material. For single color jobs the material is typically sent through a conveyer belt drier set to approx 350 degrees to dry the ink. This method is typically applied to flat polyester neck id card holder material. Not as durable as screen printing. Typically printing on one side only. Hot stamping is mostly performed in a single color on one side of the material. 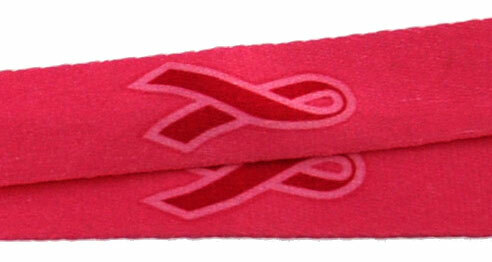 The material used is polyester in 3/8" and 5/8". The design is transferred to the material via heat and pressure. A metal plate is produced with the imprint information raised from the surface. Typically the plate is held by a chase and inserted into the stamping machine. The color to be printed is referred to as film and is held on rolls. The printing process takes place when the metal plate is lowered onto the material with the color film in between. Each printing cycle results in the advancement of material and color film. Digital printing refers to methods of printing from a digital based image directly onto a variety of substrates. It usually refers to professional printing where short run jobs from desktop publishing and other digital sources are printed using large digital format printers. The main difference between digital printing and traditional methods such as lithography, flexography, gravure, or letterpress is that no printing plates are used. The most popular methods include inkjet or laser printers that deposit pigment or toner onto a wide variety of substrates including paper, vinyl, cotton, canvas, glass, metal, marble and others.